The divisional line between the Benton and Niobrara Cretaceous beds is placed perhaps rather arbitrarily between the Blue Victoria of Cragin and the Fort Hays Beds. 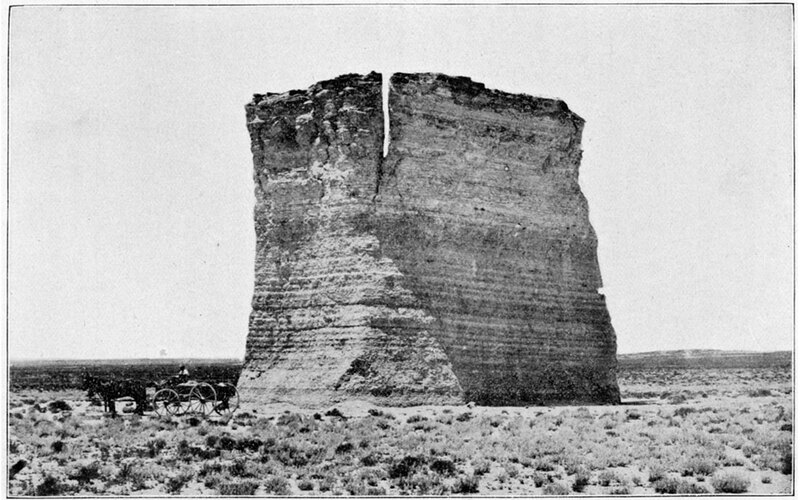 These latter strata vary somewhat in thickness-between fifty and sixty five or seventy feet-and are very persistent, both in lithological characters and in extent, reaching from Jewell County on the north to near Coolidge on the west, about ten miles north of the Arkansas river where it enters the state. It is composed of distinctly stratified, massive white chalk, or soft limestone, hardening somewhat on exposure. Its microscopical characters are similar to those of the upper Niobrara. The rocks have yielded a few vertebrate fossils, especially a large Plesiosaur in Jewell County. Mosasaurs and Pterodactyls seem to be wholly wanting. The invertebrate fossils are for the most part, Ostrea and Haploscapha, together with Inoceramus. They are usually, however, in a more or less comminuted condition. The Blue Hill shales beneath them are entirely conformable, apparently, and are very easily distinguished by the large and numerous septaria which they contain. Crystals of selenite are often abundant in the shale, as is so usually the case in the blue shaly deposits of the Cretaceous throughout the succeeding formations. An escarpment of the Fort Hays beds at the mouth of Hackberry creek in Gove County has above it, and lying conformably, the less distinctly stratified chalk of the Upper Niobrara, which, though nearly barren in fossils, shows some of the characteristic fishes of that formation. The Fort Hays beds disappear beneath the upper beds some miles further west, near the post-office known as Ailanthus. The thickness of the upper Niobrara beds, the Pteranodon Beds of Marsh, the Smoky Hill Beds of Cragin, are not less than 300 feet, and in all probability are nearly 400. At Elkader, in the valley of the Smoky Hill, repeated observations with a good barometer, gave 290 feet as their visible thickness. Wells in the vicinity had penetrated at least 40 feet more without reaching the Fort Hays beds, making in all 330 feet as the total thickness at this place. From this may be subtracted perhaps 25 feet as the amount of dip between the table land and the bottom of the valley, leaving over 300 feet. There are many difficulties in the way of an absolutely correct measurement" of the outcrops. The rocks nowhere present clear lines of stratification over extended areas. A slight difference in the coloring or in the effects of weathering is all that can be relied upon. Furthermore, there are no extended areas of denudation where the general dip can be measured, and, in addition, there are numerous local disturbances which interfere with observations on an extended scale. These local disturbances are of more than passing interest. Nowhere have I seen faults of more than a few inches in extent, but frequently slight anticlinal or synclinal bendings are observable, the strata rarely dipping at an angle of fifteen or twenty degrees for a few hundred yards. The dip is north of east of from 10 to 20 feet per mile. This general dip is evident from the much more sloping banks of the valleys on the south side of all the rivers. 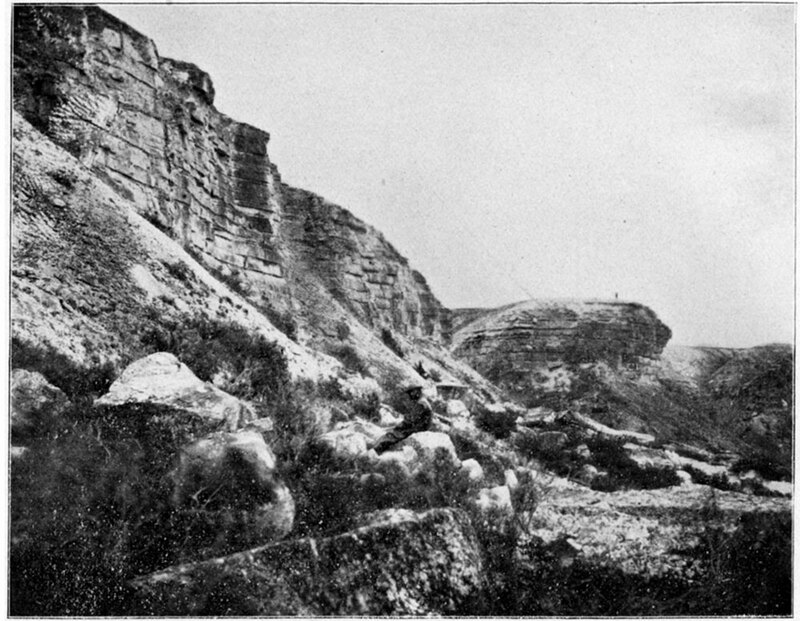 The Fort Pierre beds of at least 100 feet in thickness are exposed on the North Fork of the Smoky Hill at McAllister at nearly the same elevation as the Fort Hays. beds fifty miles south near Coolidge. For this reason I very much doubt the occurrence of Fort Pierre on the upper waters of Butte creek, and on the White Woman. If they should prove to be Fort Pierre then there must be a considerable non-conformity between the two formations. In the upper part of the Pteranodon Beds, or Ornithostoma beds as they must be called, since Pteranodon is a synonym of Ornlthostoma, one can not be unobservant of the numerous seams or veins of calcite standing nearly vertically. 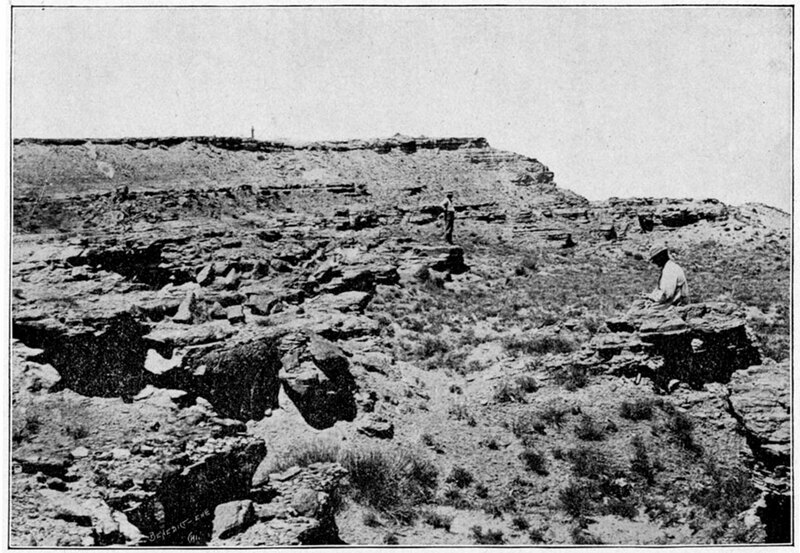 [Marsh In his latest published scheme of the geological epochs (American Journal Science, Dec, 1896), applies the name Pteranodon beds to the whole of the Colorado epoch!] They run in all directions, but are usually nearly vertical. Their thickness often varies appreciably within short distances. Often they are not more than two or three inches in thickness, though not rarely reaching a thickness of a foot. In the large veins the calcite crystals are often very pure and perfect, intermixed more or less with crystals of barite. I have never observed foreign material in them. I doubt not that they represent simply cracks from drying, the crystals formed from infiltration. Possibly, however, the numerous local disturbances in the formation may indicate other causes. Plates XXXIII and XXXIV. Plate XXXIII—Outcropping of Niobrara Chalk, Plum Creek, Gove County. (Photographed by Williston.) From Kan. Acad. Sci., vol. XIII. The material of which the Ornithostoma beds is composed is true chalk throughout their entire thickness. There is no marl, no sandstone or other material. The color varies, often within short distances from a light blue to a lavender, a white, a buff, a yellow or even a red. This color is, however, not confined to any horizon, save that the lower horizons have the color usually lighter blue or purer white. The yellow color with its varying shades of red where much exposed is confined to the upper beds, and the line of separation is very easily traced from the Smoky Hill east of Monument Rocks to the Saline north of WaKeeney, and thence to the South Fork of the Solomon near Lenora. Not only is the color line easily traced, but the fossils contained in them are characteristic. For convenience I will call them the Hesperornis beds and the lower strata the Rudistes Beds. The impurities of the chalk vary from less than two to about ten per cent. It is strange that the division into chalk and shale beds should have been persistently adhered to by writers on the Kansas Cretaceous since the time of Mudge. As I have already said more than once there is no such geological distinction. As a usual thing the blue chalk and its weathered blue shales are found lower down in the valleys of the rivers or their tributaries, that is, where it is more or less saturated with water. Almost always borings for wells encounter the blue chalk, not white or yellow. Furthermore frequently one will observe the blue chalk changing to white and yellow as it passes outwards from the water courses, and this change may take place within a few yards distance. Pure white or yellow homogeneous chalk may be traced through every foot of the entire thickness from the Fort Hays to the Fort Pierre. I trust the myth of chalk and shale beds will not be again repeated. Wherever the chalk is of a deep blue color, when exposed it becomes shaly, loose and friable, broken up apparently by the action of the pyrites which such beds often contain in large quantities. Nodular concretions of pyrite are found in some localities in great abundance. Near Castle Rock, I remember seeing one such locality years ago, where the small round nodules, like grape shot, could haw been gathered up by the wagon load. The decomposition of these nodules in the chalk produces an abundance of gypsum crystals, sometimes appearing on the surface as excellent selenite, but more often loosening the chalk into a friable dusty mass, injuring or destroying fossils that may be contained in it. Water percolating these shales becomes so thoroughly saturated with styptic salts as to be undrinkable. Weathering has left the exposed chalk in many places eroded into picturesque objects. The famous Castle Rock, in the valley of the Hackberry about ten milles from its mouth is a lone pyramid several hundred yards from the upland. My first knowledge of the Rock dates from October 1874, and since that time I have seen but little evidence of erosion. In various places throughout the chalk beds of the Smoky Hill river I have observed marks scratched by myself eighteen years previously that appeared as clear almost as when they were made. The erosion in general is not nearly so rapid as one would think. The smooth, worn surfaces made on the projecting angles of many low cliffs by the buffaloes are still to be seen nearly as smooth as they were twenty years ago. I have seen buildings made of the chalk more than twenty years ago still remaining with but little indications of wear. One such building is at Manhattan, or was a year or two ago, erected by the Union Pacific Railroad company from blocks that had previously done like service in western Kansas. Its surfaces show but little effects of weathering. Erosion takes place much more rapidly by undermining than by direct abrasion of the surface. Blocks lying in their natural plane of stratification will strongly resist wear, but when once toppled over so as to bring the lines of stratification vertically or obliquely they go to pieces within a year or two. One of the most famous landmarks of the Niobrara is the Monument Rocks on the Smoky Hill river. See Plate XXXV. When I first saw them in 1874 the place had been recently abandoned as the stage station of the Overland stage route. A vertical crack in the main rock has deepened very much since that time and it is now but a question of a few years when it will topple over and be demolished. Plate XXXV—One of Monument Rocks, Niobrara, Smoky Hill Valley, Gove County. (Photographed by Williston.) From Kan. Acad. Sci., vol. XIII. A few miles west of Elkader in the Smoky Hill valley there is another conspicuous area of rocks resembling at a distance the ruins of many castles, and known as "Castle City," a name given it by myself twenty years ago. Notwithstanding the general homogeneousness of the Ornithostoma beds in their lithological characters throughout their whole extent, there is a very distinct difference between the upper and lower horizons in the fossils. I have never made any special study of the invertebrates, and not very extensive collections, but from the thirty or more months of explorations I have become fairly familiar with the invertebrate fauna. But very few collections have been studied by paleontologists, and I am sure that the field is rich for such explorations. Of the mollusca, Ostrea congesta is of very great abundance in the Rudistes beds, but much less common in the Hesperornis beds. They are found attached to other shells, and it may perhaps be in consequence of the fewness of large shells in the upper strata that their comparative rarity may be ascribed. Several species of Inoceramus are apparently found in all horizons, but the Haploscaphas are abundant only in the lower horizons, and I never have found H. grandis or those allied to that species in the upper horizons. On the Smoky Hill river near the mouth of the Hackberry there are places where these shells can be gathered by the wagon load, often distorted, but not rarely in extraordinary perfection. 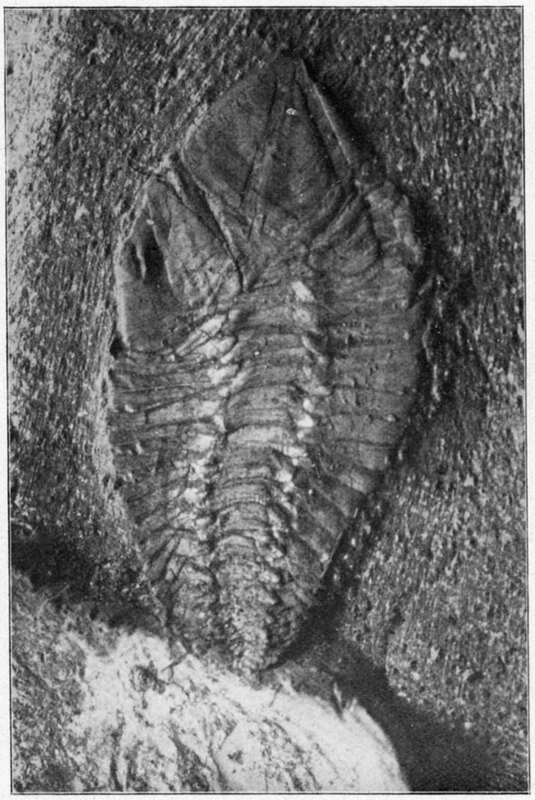 A very thin shelled Inoceramid measuring in the largest specimens forty four by forty six or eight inches is not rare over a large part of the exposures. Invariably where exposed, as they sometimes are in their entirety on low flat mounds of shale, they are broken into innumerable pieces. For that reason, I have never known of one being collected complete, or even partially complete. Notwithstanding their great size the shell substance is not more than an eighth of an inch in thickness. Fragments of Rudistes are not rare in some places in the lowermost horizons and I have seen specimens near the Saline river northwest of Ft. Hays into which one could thrust his arm to his elbow. They are totally wanting in the Hesperornis beds. Of the cephalopods, ammonites occur, though rarely, and almost always only impressions are found, with but little of the shell substance. Once or twice I have seen such impressions a foot in diameter. Belemnites are not common; one will scarcely find a specimen in a day's search anywhere in the beds. I have never observed any difference in their abundance in the different horizons. One or more forms of chohdrophorus dibranchiates are not at all rare, though almost always represented by unrecognizable fragments. The nature of these fragments was for years a great puzzle to me. They are usually but a few inches in length, and are of a glistening fibrous character. Recently a nearly complete specimen collected by Mr. H. T. Martin has shown them to belong to a large cuttle fish, apparently different from any described genus. The gladius measures about six inches in width by at least a foot in length, and has the sepia bag about two inches wide and an inch thick below it. The surface is smooth, lustrous, its material rather shaly and soft. I have observed the shafts most frequently in the Hesperonis beds, but they may be as abundant in the lower strata. Baculites have never been seen in the Niobrara of Kansas so far as I am aware. The Baculites ovatus deposit at Sheridan, for a long time supposed to be from the Niobrara, I showed several years ago to belong in the Fort Pierre. Echinodermata are represented, so far as I am aware, by a single genus, Uintacrinus, first described from Kansas specimens. All the specimens of which I have any knowledge have come from the vicinity of Elkader, in the valley of the Smoky Hill, in the horizon just below the yellow chalk. The largest colony hitherto discovered measures about seven feet in diameter and is now mounted in the University of Kansas museum. Another colony that may belong to a distinct species, but is more probably the young of socialis, is of about half the size of the larger colony and contains many hundred calyces of less than a third of the diameter of those of socialis. An examination of these specimens in the two colonies, and of another a little less large, shows many variations in the arrangements of the plates. Among them are specimens which can not be distinguished from U. westfalicus, which I believe to be identical with socialis. It is not at all improbable that various species of crustacea will be found in the chalk. So far, however, I know of but a single one, a species of Cirrhiped figured in the accompanying Plate XXXVI, and which I will call Pollicipes Haworthi, after Professor Haworth, who discovered it near Gove City. I am not quite sure that it belongs in the genus Pollicipes, but I believe the photographic illustration will render its recognition tolerably certain. The specimen is attached to a shell of an Ostrea congesta. Lying close by it are two more specimens, one of them about one-third the linear dimensions of the one figured, the other about one half. Its horizon is the yellow chalk. Fossil wood is occasionally found in the formation. A tree about thirty feet long was discovered near Elkader a year or two ago. In the bark of fossilized wood fragments of amber have several times. been obtained. Near Russell Springs, Mr. H. L. Martin found a mass of pure charcoal imbedded in the chalk. I have never seen impressions of leaves. At several places in the upper part of the formation there occur thin seams filled with fragments of bones, scales, teeth and similar remains much broken up and comminuted. No coal, of any character has ever been discovered in the formation, and from the nature of the beds can not be expected. The Niobrara deposits have been famous for the past twenty five years for the abundance, variety and perfection of its vertebrate remains. Many tons of fossils have been collected for various institutions and individuals, among which may be mentioned Yale and Harvard Universities, the University of Munich, and of Kansas, the National Museum, Professor Cope, etc. In his publications, Professor Marsh has stated, or left it to be inferred, that his 'personal explorations in this as in other fields were extensive and that the larger part of the fossils described by him were the results of these explorations. The actual fact is that since 1875, when my personal relations with Professor Marsh began, he himself did no field work, his knowledge of the formations being derived from a few transient and hasty visits to the different fields where his collectors were at work. Mr. Hatcher has already mentioned the extent of his personal explorations of the Laramie Cretaceous, which may be taken as a sample of all the field work done by himself. His reference to the personal dangers encountered from hostile Indians is amusing in the extreme to all those who know the facts. I think that I can say without fear of dispute by those who know the facts that Prof. Marsh never ran any greater danger from Indians than when he entertained Red Cloud at his home in New Haven. This statement I think is called for in justice to his collectors who did expose themselves to real and often imminent dangers from hostile Indians, but who were rarely or never mentioned by him in his publications. And of these mention should especially be made of the late Professor Mudge, the veteran Kansas geologist. A correct list of the various species and genera of Kansas Cretaceous vertebrates can not yet be given. Many species have been described which will have to be abandoned. Our knowledge of the fishes is the most incomplete and fragmentary, notwithstanding the extraordinary abundance of their remains. I can say but very little regarding their distribution in the different beds, inasmuch as I have collected but few from the lower deposits. In general they are infrequent in the Rudistes beds, though remains are found quite to the Fort Hays deposits. A collection of species of Ptychodus teeth, in which the largest grinders measured three inches in length and which I have not yet succeeded in determining, was obtained some years ago from near the base. There were 140 in the set. The same species in isolated specimens, or in groups of a dozen or more has been obtained more recently from these beds, but the species has never yet been found in the Hesperonis bed. Six genera of Mosasaurs have been referred to the Kansas Niobrara—Clidastes, Tylosaurus, Platecarpus, Holosaurus, Sironectes and Baptosaurus. The last two I have never seen, but, though Merriam's determination of Baptosaurus is based upon slight material, it seems authentic. The genus must occur very rarely and posaibly comes from the Pierre deposits, which have always heretofore been confounded with the Niobrara. Sironectes I believe to be a doubtful genus, and Holosaurus is not distinct from Platecarpus. The distribution of these genera is of some interest. In all my collections I have yet to learn of a single specimen of Clidastes being found in the Rudistes beds, or indeed anywhere save near the top of the formation. The other genera extend to within a hundred feet of the base of the Ornithostoma beds, and possibly lower down. An examination of more material may perhaps show a restricted range in the species. I need not call the attention of future collectors to the importance of locating the horizon of specimens more accurately than has been done heretofore. Of the Pterodactyls two genera and eight species have been ascribed to Kansas. In the examination of the extensive material in the University of Kansas I so far find evidence of but five species. The largest is Ornithostoma ingens, of which O. umbrosus is a synonym. This species measured in life eighteen and one half feet from tip to tip of wings. A restoration now completed will shortly be published. This species is by far the most common in the formation, and almost the only one that I have found far down in the deposits. This does not necessarily mean that the smaller species are later than the large one, but rather that the lower deposits mean a deeper sea and more remoteness of the shore line. Nyctodactylus has been found in the yellow chalk only. The turtles are especially characteristic of the uppermost deposits. Near the upper part of the yellow chalk remains of various species are common; in the lower strata they are rarely or never found. The Plesiosaurs occur in about equal abundance throughout the deposits. They are at best comparatively rare, but are relatively far more abundant in the lower beds. Finally the toothed birds are, I believe, confined to the upper beds. The only possible exception is that of the type of Icthyornis which was found by Mudge near Bread-bowl mound in Rooks County. In general, vertebrate fossils of all kinds are far more abundant, at least ten times so, in the yellow beds than in the white beds below them. I believe that this is due to shallower water and nearer shore lines. The recognition of the Pierre deposits within Kansas was first made by myself in 1891. I recognized then only the deposits on the North Fork of the Smoky Hill, which had previously been considered to be Niobrara. Vertebrate fossils from this locality had been collected by Mudge and Marsh, and it is not at all impossible that some of them have been described as Niobraran. I found in 1891 two species of saurians at this place, both of which are different from any that I know below. Later a specimen of Clidastes, obtained by Mr. Sternberg from this same locality, was described by me as C. Westii. Another species of Clidastes I have since seen from Colorado. So far this is the only genus of vertebrates from the Pierre that is known to occur in the Niobrara, though the turtle Arcalon of Wieland seem very closely allied to Protostega. The genus Mosasaurus of the Pierre is closely allied to Clidastes, yet sufficiently distinct to be separated. Tylosaurus is replaced by a peculiar genus, of which a brief description was given by myself in the Kansas University Quarterly, vol, I, p. 10. Further study shows that the genus is entitled to a generic name, for which I propose Brachysaurus. It can not yet be said that the Pierre deposits are conformable in Kansas with the Niobrara. Hay has recorded the beds from Butte Creek and the White Woman, but I believe that he is in error in these references, He also recognized the beds in Cheyenne County as Fort Pierre, a determination confirmed by Mr. Logan in this Report.